David Flint, a retired engineer of the General Post Office, addressed the Newark Arcaeological & Local History Society (NALHS) on the theme of telecommunications through history, with special reference to postal stations in Newark, for which he had worked. The speaker surprised his audience by referring to inter-person communications from their earliest times. Missives, he reminded us, could only be sent by means of the pony express until the 1830s, for mankind knew no electronic or mechanical techniques, nor had motorization developed the 'Post Office van'. The pony express could operate within a range of 100 miles a day; so any greater distances would need to be staggered according to the tiredness of the rider. Newark, it seems, dealt with hundreds of letters each day. But not every communication had to be made by means of pen and ink. The system of beacons, or the lighting of signal fires at regular, visible, intervals was another technique, used mainly to issue warnings across the country. These, being prearranged, required no further explanation. King Edward I initiated the system in 1372. Beacon Hill, Newark, as its name implies, marked the site of one such beacon. The idea was that at the next beacon in the chain, a set mileage away, lighting would take place when smoke and light from the preceding fire were discerned in the distance. By this means, the whole country could be warned of an imminent danger. No written or spoken words were needed; indeed such would have been slower and more laborious. The Beacon Hill beacon chain was first used in 1588 to warn of the approach of the Spanish Armada. Electronic technology began to see the first light of day in 1830, when Faraday discovered electro-magnetic induction. Morse code, a tapped-out or system of long and short sounds (commonly known as ?dots and dashes') was deployed. Each letter of the alphabet was made up of a different combination of these sounds. Later, a telegraph network was born, thanks to Cook and Stephenson. Telegraph poles, again separated by measured distance of 352 yards, delivered the message through connecting wires. Telegraph poles became a familiar part of the English landscape, especially in rural areas, and they may still be seen in places today. By and large, though, since 1909 the wires have been placed under the ground, owing to the greater need for stability in such conditions as adverse weather. Overhead wires, which became increasingly overcrowded with the expansion of the system, also posed the risk of lightning. It may be that the designer of the underground strategy also had in mind the æsthetic advantages of removing the visibility of the wiring. The telegraph system was expanded in 1836 and again in 1843. The year 1846 saw the railway used to deliver telegrams from Newark. The town became one of 150 stations across the land. Telegraphy was an ingenious system, highly capable. In recorded cases, the capture of criminals was effected by telegraphic communications. In the 1840s, a telegram could be sent to a recipient for five shillings. The town expanded its network in 1852, when the Northern railway line was built around what is now known as North Gate Station. Effectively, and proverbially, the world was getting smaller. Internationally, also, developments were on the way. 1858 witnessed the opening of a transatlantic cable, facilitating communications with the United States of America. Many an English politician has since taken advantage of established relationships with this larger continent! But extra useage, especially business useage, and the need for extra mileage of wiring meant that equipment lost something of its versatility. Cables needed replacing more frequently. By 1903, 100 million telegrams were being sent yearly. So far as Newark was concerned, the first telegraph exchange was in the Post Office adjacent to the later Corn Exchange. It was in 1869, when the service was moved to Wilson Street, that the need was first seen for an underground cable. Then, owing to the expansion of the Post Office system for telegraphs, which combined all previous systems, it became necessary to use an area code. In 1869, the invention of the telephone by Alexander Bell simplified telecommunications, enabling their use to the public via telephone kiosks. The first of these bore little resemblance to the familiar red telephone box, which have largely been superseded in the twenty-first century by the ownership of mobile phones. There were also purpose-built boxes such as the blue flashing police box or, later, boxes for which motoring organizations like the AA or RAC were responsible. Nor would the telephone devices themselves be at all recognisable to anyone today. In 1880, an attempt was made to extend the telegraph service into private homes, though initially unsuccessful. By 1888, Newark’s telephone exchange had been built in Portland Street. 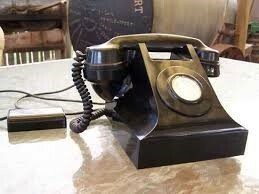 A home telephone, when first introduced, would cost £33 / 7 / -. In 1891, the idea of an automatic switch for home or public phones was muted. Previously, connection had to be made by means of an operator, who spoke to the telephone user the moment the receiver was lifted. He or she then made the connection by means of inserting specific wires into connectors. This was done inside a manual telephone exchange, which served a limited local area. The new system meant that the user could make that connection himself, or herself, by means of a dial. Where this meant connecting to another exchange, the area code had to be dialled first, before the recipient’s personal telephone number. This however, would only work inside what was termed the ?local zone', an area within a radius of twenty miles or so. The development of subscriber trunk dialling, or STD, did not appear until the 1960s. Prior to this, the operator could still be spoken to by dialling 0 (when STD came to be, this was changed to 100) - and a longer-distance connection could still be made via the early method of operator-connection. STD, introduced gradually across the exchanges, eventually eliminated the need for this, and, today, international calls can also be dialled using identifying codes. 1899 saw the transfer of all trunk lines to the Post Office. Newark’s Post Office, once a towering building, was relocated in Kirk Gate. Today, it has moved again to Paxton Court, where its scope of operations has been limited, as much postal and telegraphic work can only be done through such larger centres as Nottingham, Manual exchanges, during their lifetime, had become increasingly complicated in appearance (the speaker illustrated this point in his slides). Newark’s last manual telephone exchange was at Warwicks brewery, North Gate. The invention of the valve and amplifier in 1903 enabled further expansion of the telecommunications service, increasingly for business use. In 1938, Newark opened the Repeater Station in Water Lane, off North Gate. The complexity of its machinery might be compared to that of Bletchley Park, Britain’s wartime operations centre for the decoding of intercepted enemy messages. The 1940s, though, saw the opening of smaller automatic exchanges. It was at this time that the transatlantic cable was established as a national asset. Newark may be credited in so much as the senior engineer, Frank Hough, was a former student of the town’s then Magnus Grammar School. The 1980s saw further development as electronic equipment took over. This meant that systems could be smaller and finer. Today they are digital, and the wires are fibre-optic, which is very fine. This has, though, done little to reduce the number of wires, which today can only be interpreted by an expert, well-trained eye. What, then, will the future bring? In the twenty-first century, one can choose from computer-generated electronic mail (?e-mail'), mobile or landline telephones activated by pressing buttons rather than by dialling, text messages sent electronically or by fax, or the more traditional and slower method of posted mail. Expansion is challenging, but also brings its dangers; so-called ?hackers' have found the means to obtain personal data and use it for dishonest gain, and techniques that used to be straightforward now require the use of passwords known only to the rightful user. David Flint was thanked for an interesting and often nostalgic recollection of the developing service. © Roger Peacock for NALHS: February, 2018. Alternatively, Morse Code could be implemented using long and short flashes of light, a strategy usually used at sea. This meant that there were fifteen telegraph poles per mile. 1846 was the year when the Railway Age first came to Newark in the Midlands line or Newark Castle Station. However, the Kirk Gate premises have been conserved; today they are a bar and restaurant using the name of ?The Old Post Office'. This has now been donated to the Newark Museum Service. For some time, it could be seen in the shop frontages displayed in Mill Gate Museum. Since the closure of that museum, it has been kept at the service’s Resource Centre in Brunel Drive. The Magnus is a long-standing educational institution, first bestowed to the town in the sixteenth century by Archdeacon Thomas Magnus, when the original school was in Appleton Gate. Today its successor, the Magnus Church of England Academy, Earp Avenue, still seeks academic excellence for all its students. This page was added by ROGER PEACOCK on 08/03/2018.